UMCOR Haiti and the United States Agency for International Development (USAID) signed a cooperative agreement to work together in the community of Haut Damier, located in the town of Cabaret, about 15 miles north of the Haitian capital. The partnership began with USAID’s plans to construct 156 new homes in Haut Damier for earthquake-affected families. To bind these vulnerable households to the existing social fabric, UMCOR Haiti designed cross-community water, sanitation, and hygiene (WASH), livelihoods, and education services that will increase the ties between USAID’s beneficiary households and the existing residents, and improve living standards for all. Under PISANS, the WASH component includes improved access to water through household rainwater-catchment systems, a hygiene-promotion campaign that utilizes local health promoters, and the distribution of hygiene kits and water-storage buckets. The education component includes improvements to four existing schools through a combination of repairs; the provision of new classrooms, kitchens, and water and sanitation facilities; and teacher training. 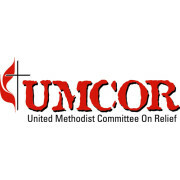 UMCOR responds to natural or civil disasters that are interruptions of such magnitude that they overwhelm a community's ability to recover on its own. We partner with local partner organizations and survivors to rebuild their livelihoods, health and homes. In times of acute crisis we mobilize emergency supplies, fresh water, and temporary shelter to stricken areas, and then stay as long as it takes to implement long-term recovery. Our workers are known all over the globe for their compassion, leadership, expertise and guidance in recovery efforts. UMCOR works through programs that address hunger, poverty, sustainable agriculture, international and domestic emergencies, refugee and immigrant concerns, global health issues, and transitional development. United Methodist hearts and hands are part of every program implemented; school kit, seed, health kit, fresh water and tool distributed in the US and throughout the world; and every new house, well, clinic and school rebuilt after catastrophes of conflict or nature. Most importantly, our work connects us in a global network of generous donors and equally generous beneficiaries. In best practice, domestic and international disaster relief employs the case management model of significant participation by disaster survivors in their own recovery. In all phases of response-from the early weeks of the emergency to the long-term rehabilitation of the community-UMCOR most values the outcomes of partnerships with and self-sufficiency of survivors. Training in disaster response is a specialty of UMCOR. UMCOR underwrites innovative ministries in health care in Asia, Latin America, and Africa. Examples include community-based primary health care, HIV/AIDS programs, mission hospital revitalization, deaf and disability related ministries, health education scholarships, and community health care grants. UMCOR offers the balm of hospitality in its refugee and immigration programs. The resettlement program supports refugees both within and outside the US. Justice for Our Neighbors, working from United Methodist churches with large immigrant populations, provides free legal counsel for immigrants and asylum seekers. UMCOR seeks to alleviate poverty and hunger through sustainable development, training in innovative agriculture techniques, and partnerships with ecumenical groups. Technologies such as soy and moringa production, beekeeping, and integrated pest management, once unknown, are now in use by hundreds of farmers in developing countries. Material resources can save lives in the days and weeks immediately following a catastrophe. UMCOR Sager Brown in Baldwin, Louisiana, encompasses a mission facility for volunteers and the UMCOR Depot, a warehouse that serves as a staging area for donated emergency supplies.